Netflix, Wells Fargo, and CSX shareholders could be in for a volatile few trading days ahead. Stocks posted significant gains last week, with both the Dow Jones Industrial Average (DJINDICES:^DJI) and the S&P 500 (SNPINDEX:^GSPC) rising by more than 2%. 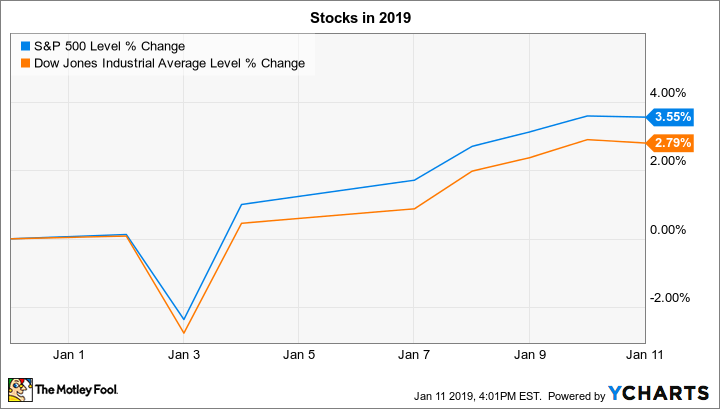 The boost left shares up about 3% so far in early 2019 following a 6% decline last year. Fourth-quarter earnings season is ramping up, with several major announcements anticipated over the next few trading days that could support the rally or send stocks back lower again. Below, we'll take a closer look at a few of the biggest companies reporting: Netflix (NASDAQ:NFLX), CSX (NASDAQ:CSX), and Wells Fargo (NYSE:WFC). Netflix was one of 2018's most volatile large-tech stocks, nearly doubling at one point in the year before shedding about 40% of its value from October through December. Those wild swings indicate investors aren't at all clear about Netflix's long-term potential, and so its earnings report on Thursday is likely to attract lots of attention. The business hasn't shown any signs of slowing. In fact, the streaming-video giant is on pace to notch its fifth straight year of accelerating global-subscriber gains, even as rising prices help boost operating profit margin to new highs. But as Netflix bears point out, the company's content costs are soaring and cash is disappearing from the books at close to $3 billion per year. Thursday's report should address whether incoming CFO Spencer Neumann has any plans to shift strategies in dealing with that cash outflow. Investors also will get their first peek at Netflix's spending plans for 2019, which should include content spending of nearly $10 billion. Railway earnings reports can provide a clear view into current economic growth trends, which is just one of the reasons why CSX's Tuesday afternoon announcement will be closely watched on Wall Street. The company fared a bit better than peers last year, thanks mainly to higher efficiency, which shows up in the operating-ratio metric. That figure improved to 70% over the first nine months of 2018 from 60% in the prior-year period, in fact. Investors this week are hoping to see more progress along those lines when CSX closes out its fiscal 2018. Other key themes to watch include volume and pricing trends and the so-called "intermodal" transport segment that management sees as supporting higher margins in the future. The outlook CSX issues for the 2019 year will be important, too, whether it relates to growth forecasts and efficiency targets or to updated goals for shareholder cash returns. Check out the latest Wells Fargo earnings call transcript. Wells Fargo will announce its fourth-quarter results before the market opens on Tuesday. The banking giant underperformed the S&P 500 by a wide margin last year, especially when concerns of a global growth slowdown peaked in December. Beyond that general exposure to economic downturns, Wells Fargo shares suffered under the weight of its fake-accounts scandal this past year. That brand hit, plus the impact of a few other scandals, helped push many of the bank's key operating metrics, including deposit and loan growth, efficiency, and profitability, below that of its peers. On Tuesday investors will be scrutinizing Wells Fargo's report for signs that it's putting these operating stumbles behind it. Other potential good news would include indications of healthy loan volumes that suggest economic growth is chugging right along. The biggest driver of better returns will come from the slow progress toward mending its brand with consumers, though.